Alice Cullen (born Mary Alice Brandon) is the adopted daughter of Carlisle and Esme, adoptive sister of Edward, Rosalie, and Emmett, and wife of Jasper. 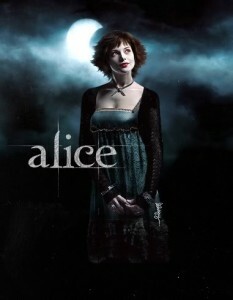 Alice is petite and pixie-like, with a graceful gait and hair that is short, spiky, and black. Her special ability is to see the future, an enhanced version of her ability to have premonitions as a human. Her ability is limited; she is only able to see the outcome of a decision once it is made. Due to this, decisions made in the spur of the moment can not be foreseen. Alice can see futures involving humans and vampires, but is unable to see those involving half-breeds, such as Renesmee and the werewolves. In Breaking Dawn, Alice theorizes that she can see vampires very clearly because she is one, can see humans somewhat less clearly because she was one, and cannot see werewolves or half-breeds because she never was one. Alice is bubbly and optimistic, and she loves and cares for Bella like a sister. She is also close to her brother Edward, and enjoys shopping, make-overs, and throwing parties. Alice’s early history is vague, as she remembers nothing about her human life and woke up alone as a vampire. It is eventually revealed that she was born around 1901 in Biloxi, Mississippi, and was committed to an asylum because she had premonitions. Alice was transformed by an old vampire who worked at the asylum to protect her from James, a tracker vampire who was hunting her. After some research, Alice found her grave and discovered that the date on her tombstone matches the date of her admission to the asylum. Through her research she additionally discovered that she had a younger sister named Cynthia, and that Cynthia’s daughter, Alice’s niece, is still alive in Biloxi. Throughout Twilight, Alice uses her ability to see the future and help Bella when she is in danger. The two soon become friends, loving each other like sisters. In New Moon, Alice foresees Bella jumping off a cliff and assumes she is trying to commit suicide, though Bella actually was cliff diving. After discovering the truth, Bella accompanies Alice to Italy to prevent Edward from killing himself. They are successful, but are taken to see the Volturi, who police the vampire world. Through Alice’s premonitions, Aro is able to see that Bella will eventually become a vampire and invites her, Alice, and Edward to stay with them; it is later mentioned that Aro especially covets Alice’s gift. In Eclipse, Alice, who proves to be an adept fighter, joins the fight to destroy a group of rampaging newborn vampires, created by Victoria in an effort to take revenge on Edward. Alice acts as Bella’s maid of honor at her wedding in Breaking Dawn and helps care for Renesmee until leaving to search out a crossbreed after the Volturi plan to destroy Renesmee, believing her to be an immortal child. Alice is successful and the Volturi, convinced there is no threat, leave.